A Five “Star” Lunch!! Fire up Your Tastebuds and Explore!! Nothing like combining products and playing around with flavors, heat levels, and textures to make a meal a little more interesting and flavorful!! We have a kitchen at work and I have stocked it with fiery goodies from all over! It also creates conversation and questions about the products and companies. So I tend to put on little mini fiery world clinics at lunchtime (as long as it doesn’t compete with the big Showcase and the internal bidding game!). Take my lunch today- leftover baked chicken- nothing special, boring, and screaming for a make-over!!!! So I used some Intensity Academy Gypsy Gold Dust and Volcanic Peppers Hot Garlic n Onion as a seasoning base. 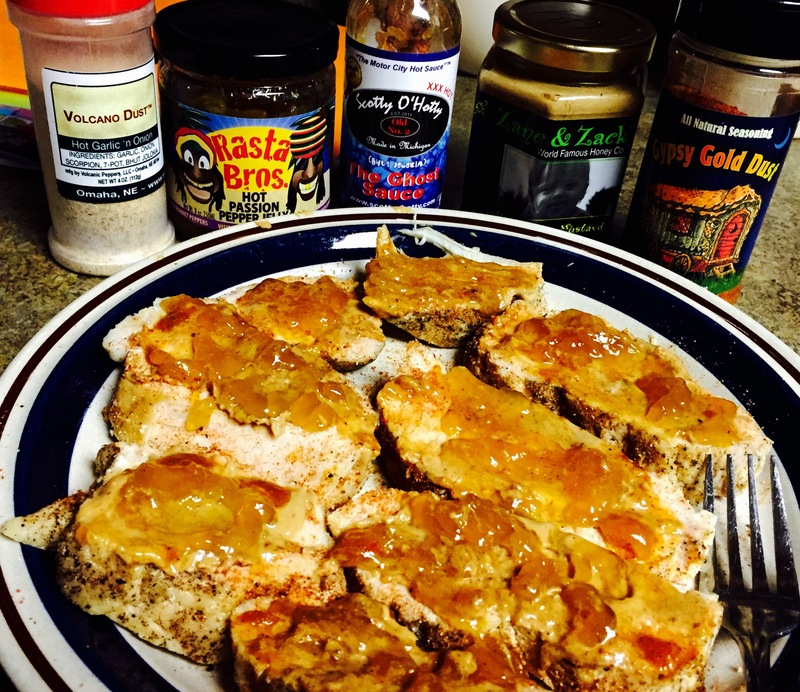 I blended some Zane & Zach’s Hab Honey Mustard, Rasta Bros. Passion Pepper Jelly, and Scotty O’Hotty Ghost Sauce as a glaze. A minute in the microwave and I transformed my dull, cold chicken breast into a fiery rainbow of flavor!! Everyone raved about how it smelled!!! But they weren’t brave enough to dig in!!! It was just a little too hot for their liking!! So don’t be afraid to “mix and match” your favorite products!! They may not all work as well as this did for me, but it allows you explore, indulge, and tantalize your taste buds!!! And most of all, it’s just another way to enjoy our collective “Fiery World”!!! Let’s Take it From the Top- Ken’s 2014 Top Ten Products on The Latest “Weekly Firecast” with Scott Roberts! In this first episode of 2015, I reveal my 10 favorite new products of 2014, and my absolute single best product of the year. I tried to target products that were newly introduced in 2014, but there may be one or two from 2013!!! I know, I know…I can’t count!!! 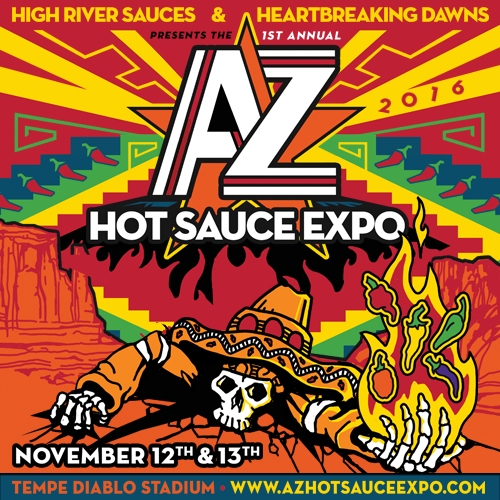 But listen up- from hot to mild, powders and sauces, and sweet to heat, I had a blast exploring the latest landscape of spicy goodness!! And there were lots of great products, but these 10 stood out as special! So have a listen and enjoy!! Why? Because, Ladies and Gentlemen, It’s a a Fiery World!! Scott chats with New Jersey-based Born to Hula Hot Sauce owners Ed and Amy Bucholtz, who make what Scott picked as best spicy food product of 2014 in their Reaper of Sorrow Carolina Reaper Hot Sauce. In his regular segment, Ken Alexander offers his choices for best fiery foods products of the year.